WASHINGTON — During a recent press conference, America’s top military officer asserted that the Islamic terrorist group ISIS, or the Islamic State of Iraq and Syria, has an ‘apocalyptic end-of-days strategic vision’ that must be defeated by a coalition of forces. 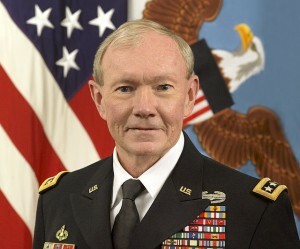 Army Gen. Martin Dempsey, chairman of the Joint Chiefs of Staff, made the statements on Thursday as both he and Secretary of Defense Chuck Hagel discussed concerns about the group. “This is an organization that has an apocalyptic, end-of-days strategic vision and which will eventually have to be defeated,” he said. Dempsey remarked that ISIS must be fought in Syria, but that various groups must join together to defeat the terrorist organization. As previously reported, Muslims believe that in the 10th century, the Islamic Mahdi—or redeemer—went into hiding, but will appear again to make all things right with the world. According to the website Answering Islam, Muslims also claim that Jesus will return as a follower of Islam and will establish the religion on the earth. Nadeem Walayat of the Market Oracle echoed these sentiments. “What ISIS and virtually all Muslims anticipate is for Jesus to return on the white Eastern Minaret of Damascus (Syria) gliding in on the wings of two angels and then through much blood and carnage will convert the whole world to Islam including killing all of the Jews, break all of the crosses and live as a Muslim for 40 years, before dying and thus heralding the final countdown to Judgment Day when Muslims expect to enter paradise,” he explained. ISIS specifically seeks to establish an Islamic State in the areas that it conquers, placing the regions under Islamic rule. Earlier this month, VICE News released a video documentary showing Abu Mosa, a spokesman for ISIS threatening to retaliate if the U.S. interferes with its establishment of the Islamic State in Iraq and Syria. “We will humiliate them everywhere, Allah willing, and we will raise the flag of Allah in the White House,” Mosa declared.